Well, if you thought this blog was lacking excitement the last few days, so did I, but all that changed today! Oh my, what a day it was. It actually started very, very early and very, very sad. 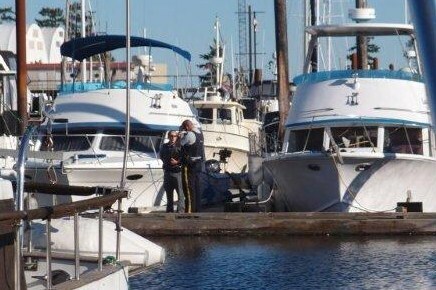 If you remember, we were in a slip in Campbell River in the Discovery Harbor Marina. It’s a large marina…many hundreds of boats there. As you know, I don’t like marinas but they are necessary and appreciated and serve their purpose. Well, last night, actually, early this morning, Val and I were both sleeping (or trying to) but we kept hearing people talking loudly and running up and down the dock. You know when you’re in the euphoric state and not quite sure what is reality and what isn’t? Well, these voices and footsteps were keeping me from my deep sleep but I wasn’t quite alert enough to assume anything abnormal; however, suddenly, I hear a horrific scream from a young woman, “Oh, God. Someone help me. Oh, God, help!” As I wake, my first thought is that some young folks are messing around and its’ late and they’re getting silly but then the cries turned absolutely horrifying! She was shrieking at the top of her lungs. I hear a splash in the water very close to our boat. Suddenly, I realized someone was drowning! No! I shot out of my berth, threw on my shorts, grabbed my huge spot light, and screamed at Val that someone was drowning right next to us! Out the door I went with the big light on searching for where the ruckus was coming from. It didn’t take long before I thought I spotted a man in the water and the terrified woman trying to pull a body onto the dock. She was screaming at the top of her lungs and could not get the body out of the water and onto the dock. Our slip was half way down “H” dock and the commotion was half way down “I” dock. I knew I could help so off I ran as fast as I could down “H” across the main and up “I” dock. Could this be happening? Was this a mother trying to rescue her young son? That’s all I could imagine. This all is happening within seconds of my awakening. Am I having a horrible nightmare? I wish it were the case. But, no, as I arrived, I saw that another man, which I assume was the fourth in this party, had helped pull the body onto the dock. I shined my million candlepower light on the scene and realize that this situation had just gotten really, really bad. In my opinion, the male body had looked like it had been in the water for a very long time. I won’t describe the details but, needless to say, the image will never leave my mind and I didn’t sleep the rest of night. I asked the young lady (I’m guessing the four of them were all in their early 30s) if she knew CPR and she immediately began working on his chest while she commanded one of the other guys to blow air into the victim’s mouth. I was so thankful that they had gotten him on the dock and that they knew CPR. I didn’t know what to do but pray. I’ll spare some of the details here but within moments the medics arrived and took over. Thank God. Val was up and dressed by then and met me as I stood a few feet away while the medics tried to revive him. Neither of us were optimistic and just prayed. Teams of professionals were arriving, sirens, lights, the works. Val and I asked the dock security agent if there was anything further we could do and then quietly walked back to our boat. What a surreal experience. Connor was at the helm when we got back to the boat sitting in the dark watching the scene unfold across the fairway. The medics were now administering the CPR and the defibulator. As hard as they tried, they could not get a response. His three friends were on their knees wailing and sobbing and crying, “Jeff, come back. Please, Jeff, come back!” The medics were still working on him as they hauled the man off on a stretcher. Oh my! What had just happened here? A nightmare? Not! An office came down our dock and visited with us a bit and said that he’d like our statement later but he had more pressing issues to deal with at the time. Val, Connor, and I convened again in our boat, prayed over the situation, and reflected on what had just happened. I was pretty shaken. Connor informed us it was now 3:30 in the morning. My guess is we had been alarmed from our slumber an hour earlier. We tried to sleep but we could hear the Royal Canadian Mounted Police up and down the docks, radios chattering, lights flashing. All I could think about were the images, the screams, the terror. I prayed they had revived the man. Finally, at 6AM, I got dressed, got the dogs leashes on and hopped off the boat heading for a doggie pottie break and some Starbucks. The RCMP immediately retained me, got my credentials, and started to question me. I gave the officer everything I knew, but admitted, it all happened so fast and I went from asleep to terror. That officer asked me to wait while he hailed the lead investigator, who came right over and I had to relive it all again for him, this time on tape. I don’t want to judge or jump to any conclusions but the officers certainly weren’t just accepting this was just an accident. I kept praying it was. I finally asked if the man had been revived. He had not. Finally, the dogs and I were released (or, in the dog’s case, relieved) and we went up for my Venti Raspberry Mocha. Ah, a bit of solace in the chaos. My heart was broken and I couldn’t get my feelings under control. I was just so grateful for my family as I knew other’s lives were shattered just a few hours ago. As I returned to the boat, there were officers all over the docks taking pictures, collecting evidence, talking to all the other boaters. I needed to get my mind off of this so I started cleaning the boat, prepared it for departure, took my shower, checked my emails, and made phone calls. At 9AM, Val and Connor were ready to go so we started our engines and departed. I was very glad to be gone. This is a night I will never forget. As I laid in bed wide awake between the time of the incident and the time I got up, I reflected on the scripture Connor shared for our devotions: Psalm 86: 1-7, where the psalmist cries out to the Lord in his time of trial. I realized that, while I actually didn’t do anything, in my heart, I was relying on my own ability to handle the situation instead of crying out to the Lord, the only God that could have saved that man. Yes, I prayed, but in the heat of the moment, I was thinking, “what can I do? I’ve got to help. I’ve got to jump in the water and pull him out. I’ve got to give him CPR. I’ve got to….” Well, maybe I’m being too hard on myself. Val says so, but, the words of the Psalmist, still ring in my ears. There are so many life lessons I learned from last night. God doesn’t waste a thing and good will come from this but it’s just hard to see right now. We had an amazing day after this but for now, I think I’ll close this entry and start afresh with a much, much brighter outlook to the magnificent day that lied ahead.